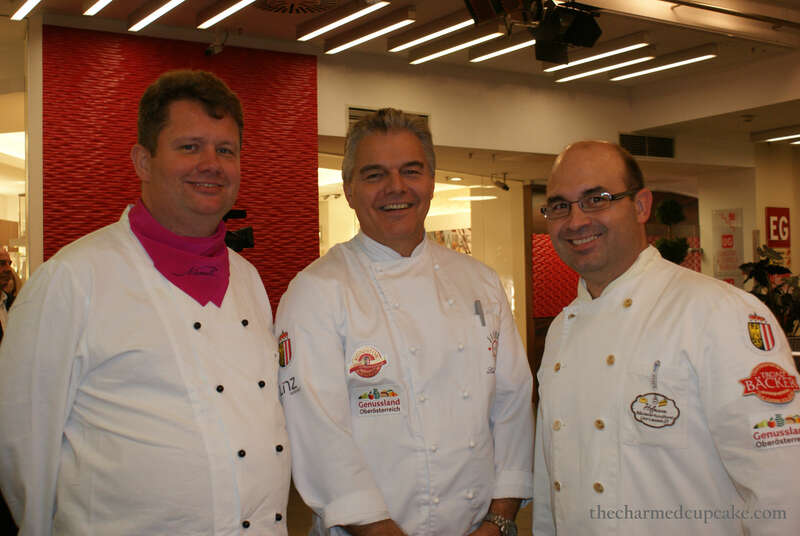 ‘Tag Der Linzer Torte’ was held on Saturday, 17th November here in Linz at the Passage City Center shopping mall. 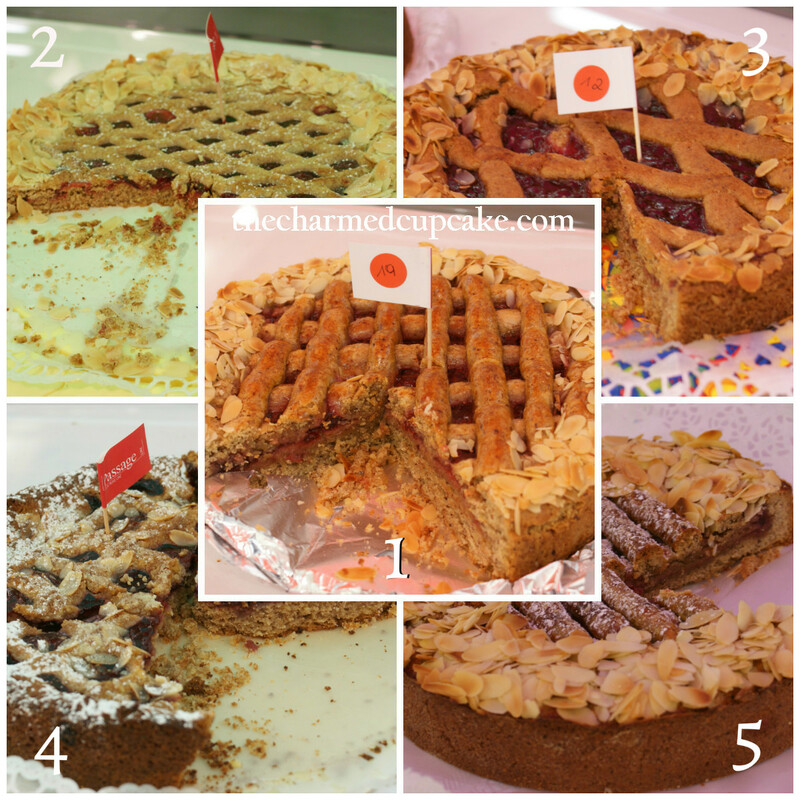 To celebrate the day of the Linzer Torte, the shopping centre held a competition where anyone could enter by baking a Linzer Torte. I only found out about this competition on Tuesday whilst I was driving to work listening to LifeRadio. Only one cake per person was allowed, cakes were to be baked at home and delivered on the Friday before the big day. So on the day of the competition, all the cakes were taste tested by 15 judges (star chef – Mike Süsser, top pastry chefs in Linz, media, tourism) and once the winners were announced the cakes were sold off slice by slice with a minimum donation of 1 Euro per slice (in my case per cupcake), the funds raised went towards a good cause (Institut Hartheim) so I did my bit for charity too. 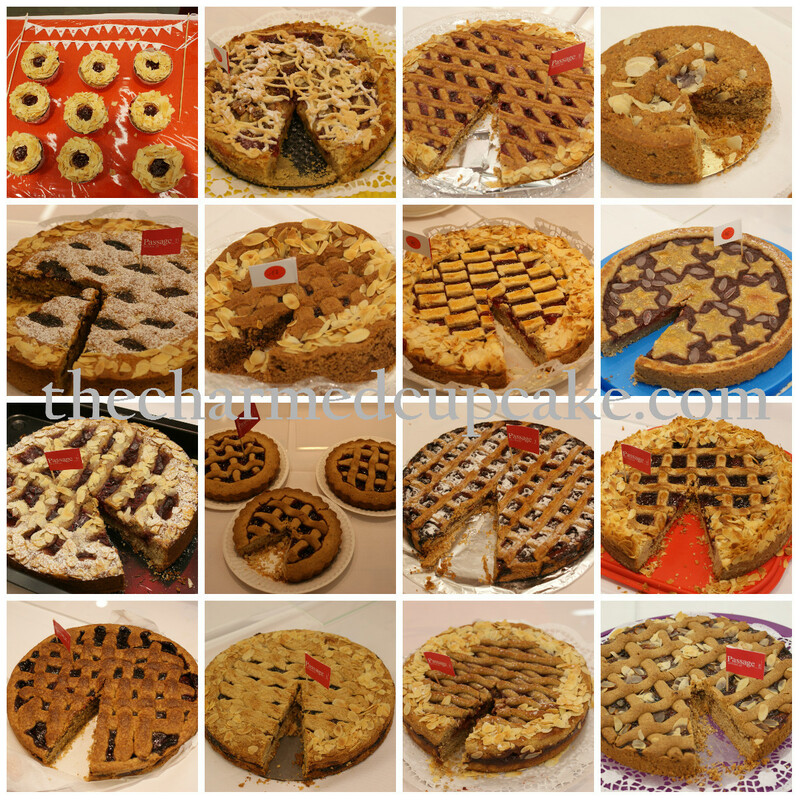 I won’t go into the whole story of the Linzer Torte as I am sure you are all dying to see the entries and find out who the winners were, so you can read up about the Linzer Torte here if you are interested. I thought the Linzer Torte Cakepop entry should have won the creative prize but I’m guessing because it wasn’t a ‘Torte’? After the event my husband and I along with a couple of friends bought a few Linzer Torte to try. 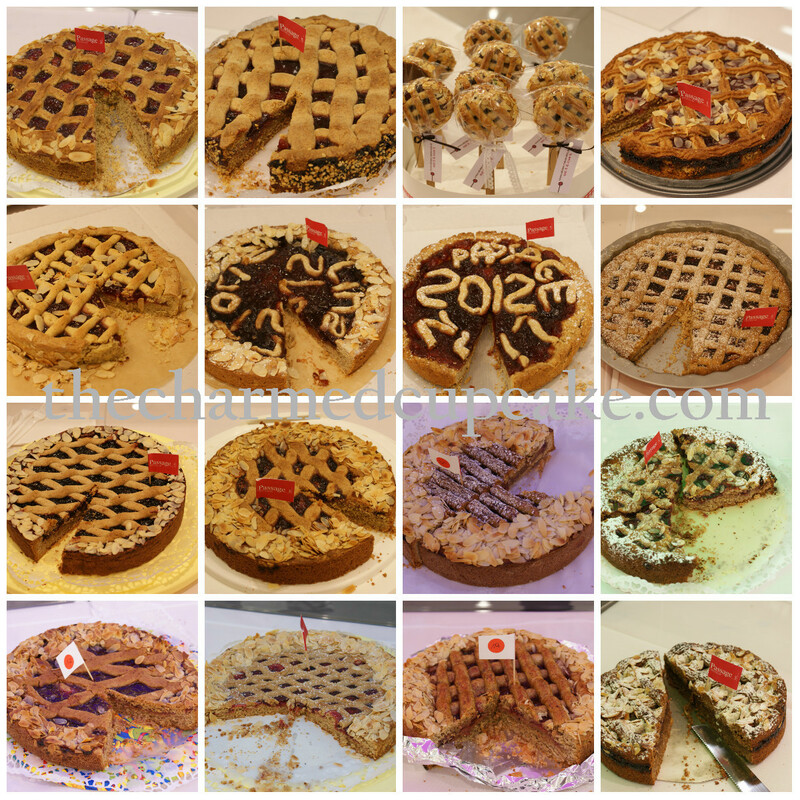 Of course I had to try the 2012 Linzer Torte winning cake and the creative prize winner’s cake. 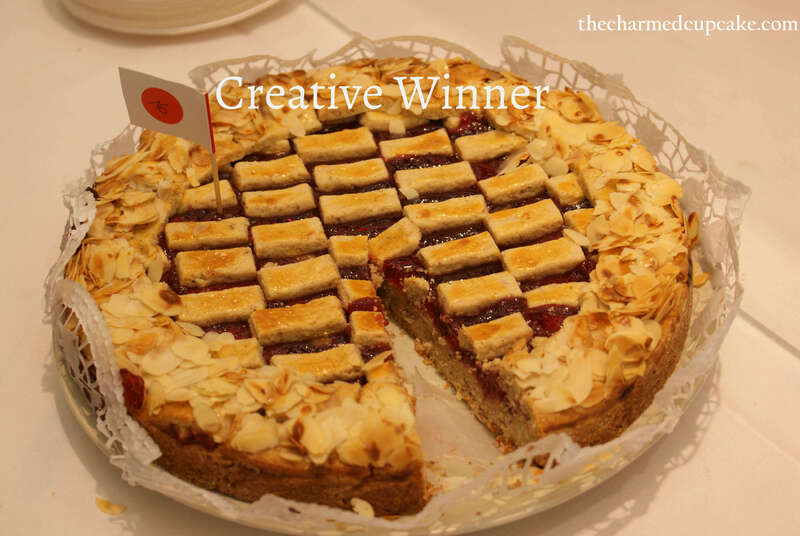 The winning cake was good, it tasted very close to the original Linzer Torte although it was quite dry around the edge compared to the ones baked by the professional pastry chefs. The creative prize-winning cake on the other hand, I have to admit in all honesty, tasted of stale nuts. Guess they didn’t judge on the taste with this one. Someone else was also quite creative by baking a Linzer Torte with banana, this made the cake very moist which we all loved. 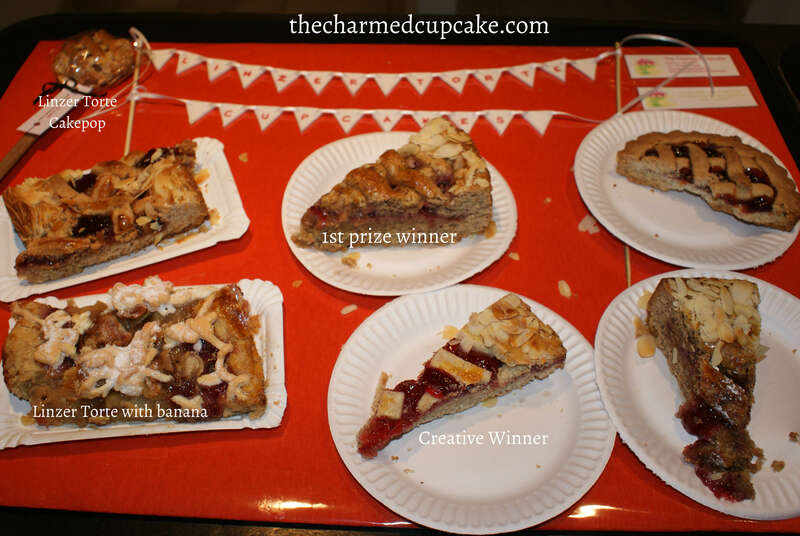 Although I didn’t come close to winning, I had fun entering my first baking competition and there was some tough competition. But I was also glad to know I had many enquiries about my cupcakes and there were sold at the blink of an eyelid. So there you have it, you be the judge although I know you can’t taste any of them I would still love to read your thoughts and see which is your favourite. 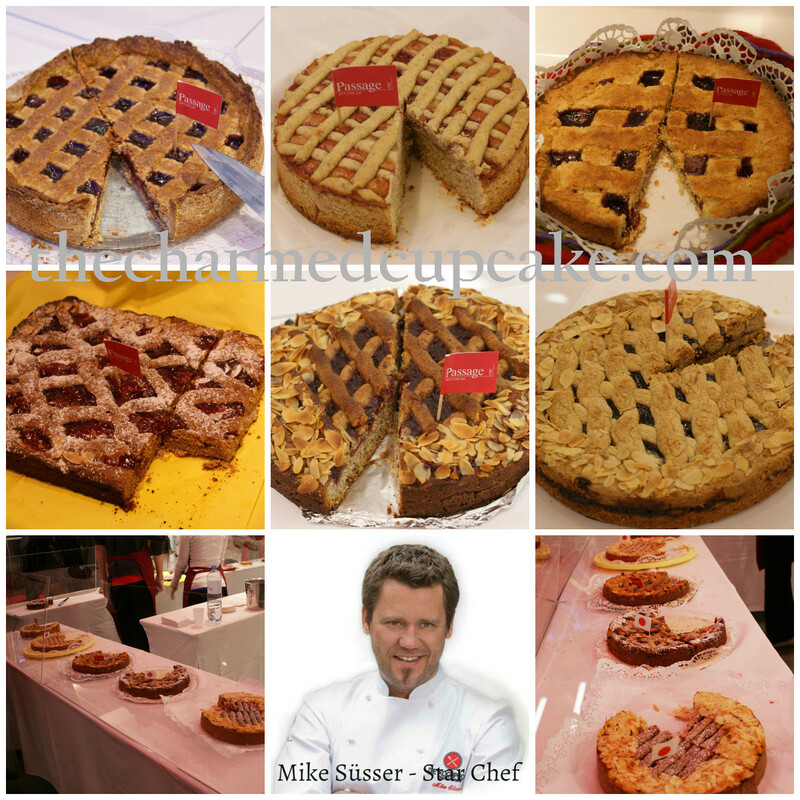 I will post my Linzer Torte Cupcake recipe in the next post and thank you all for your wonderful support on my facebook page. 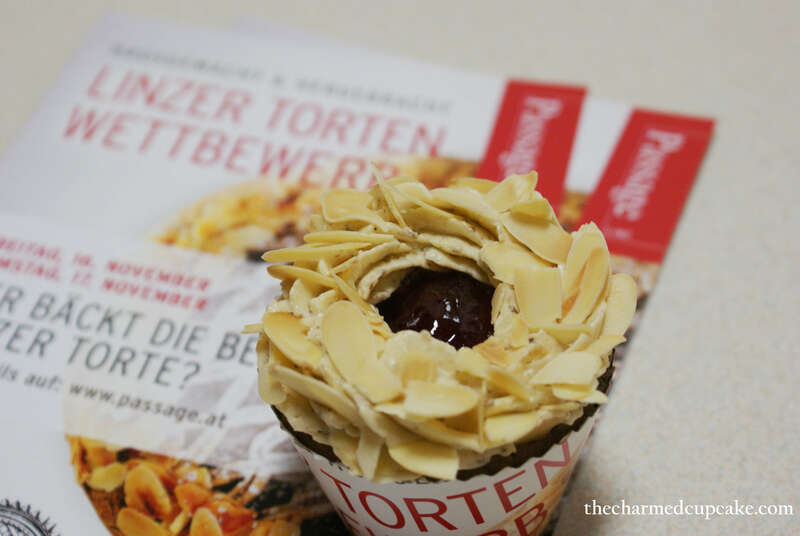 The recipe can be found here Linzer Torte Cupcake Recipe. They look great Angela! It’s ok if you didn’t win, taking part in the competition is a great experience in itself! It was fun participating, sadly it’s not happening this year. Thanks so much Russell!! 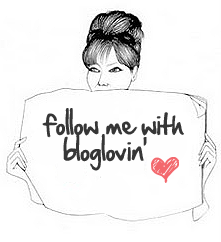 Really appreciate you taking the time out to leave a comment on my blog. I hope you had a great Thanksgiving & gearing up for Christmas now. i’m sure everyone who had bought your cupcakes had enjoyed it very much! i love your cupcake design too . 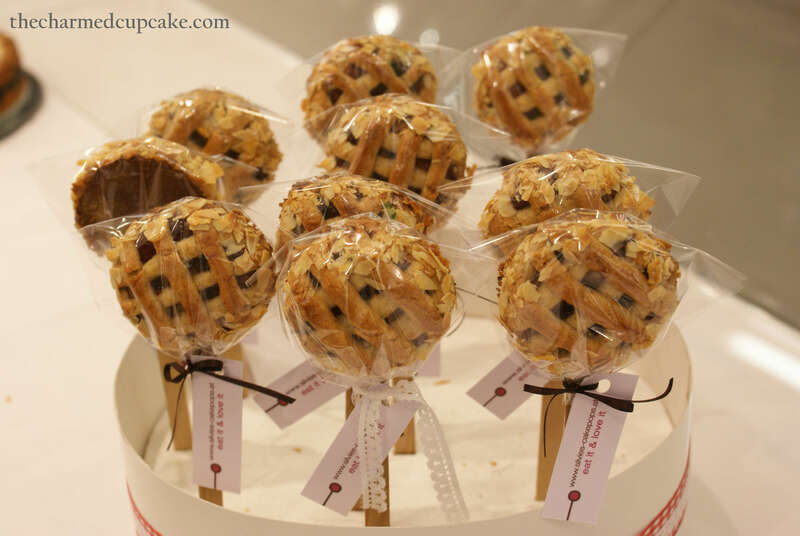 Yes, that cake pops looks very creative indeed. 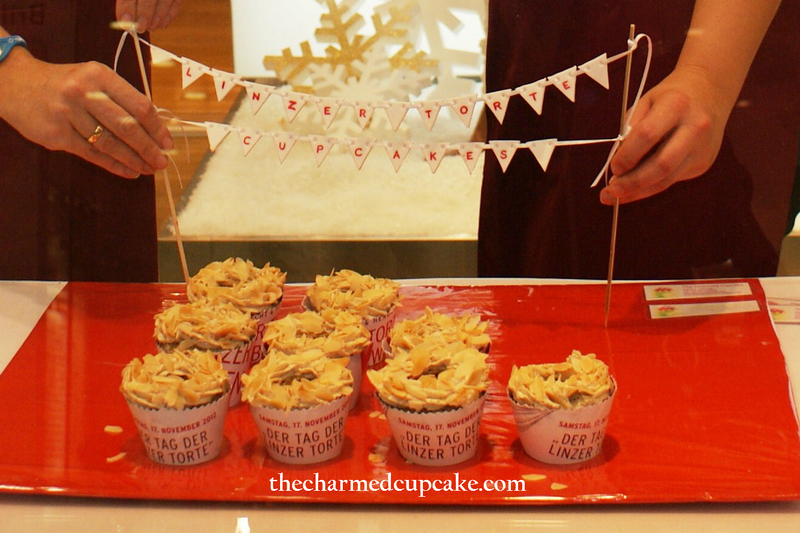 Your little cupcakes were the star of the show. If I was a judge I would have given you the first prize!!! You are the winner in my competition!!! But really I think that your cupcakes where super creative!!!! Cake pops is so last year!! 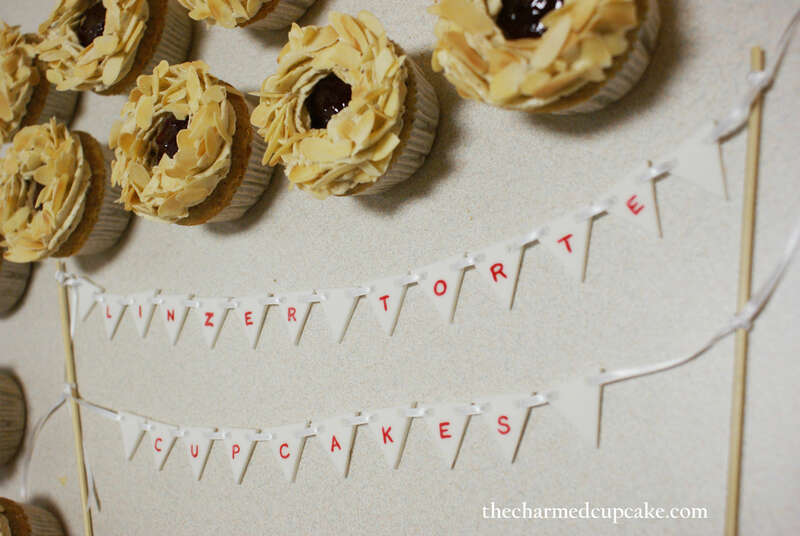 I vote for Linzer Torte cupcakes!!!! I promised an award and here it is….tadaaa… The Beautiful Blogger Award….for your beautiful blog! Your cupcake is totally creative… I don’t know what the judges were thinking! But yes, what’s important is that you had great fun baking! Ich fand die Cupcake – Idee ganz wunderbar! und als ich deinen Eintrag auf Facebook gelesen habe, musste ich natürlich in die Stadt fahren um sie zu probieren – und es hat sich gelohnt! 🙂 sie schmeckten wirklich ausgezeichnet! Gratuliere! Your cupcakes looked beautiful! Loved the almond slivers.